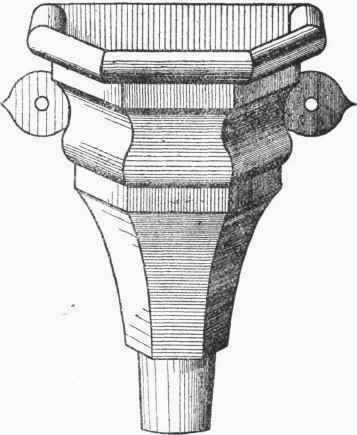 A downspout or hopper-head lends itself admirably for treatment by ornamental work in sheet zinc or galvanised sheet iron. In this case, as in the last, the shape of moulding chosen may be of any section to suit the individual taste and estimated outlay. A simple design is that shown in Fig. 197; its form in plan being that of the five equal sides of an octagon. Perpendiculars are drawn through each point down to the base line, and then produced across to the joint line. 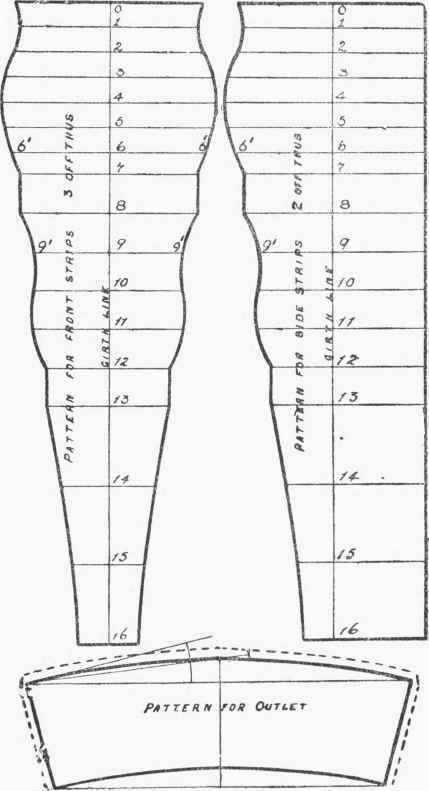 For the pattern of a front strip the girth line is first set down, its total length being obtained by carefully measuring off the parts between the numbers in the elevation and marking along as shown in the pattern (Fig. 199). Lines at right angles to the girth line are drawn through each point, and these cut off equal to the length of the corresponding line measured between the base and joint lines in the elevation. Thus, to give two examples, which should make it clear, the lines 6 6' and 9 9' on the pattern will be respectively equal to lines 6 6 and 9 9 as seen between the base and joint lines on the elevation. In the same way, all the other lengths for the pattern can be measured and marked off. It should be noticed that several of the lines are the same length; also that the lines 7 to 8 and 12 to 13 on the elevation being straight, the corresponding part on the outline of pattern will also be straight. Having found all the points for the cut, they are carefully joined up, and the strip pattern is complete. The width of the side strips at the top will be made the same as that of the front strip, the back line being drawn parallel to the girth line. It will be readily seen that the three side curves of the patterns are all the same: hence in practice it will only be necessary to mark out one curve, the others being scribed from this. The strips will be shaped and tacked together as in the last case, the complete soldering-up being done along the joints on the inside. The shape of the back of the hopper can be determined from the elevation, or marked off directly after the five strips are soldered together. Lugs should be left on each side of the back, as shown in Fig. 197. The shape of the bottom piece is shown in Fig. 198, and that for the outlet in Fig. 199, the pattern for the outlet being marked out by one of the methods explained in previous chapters.